DSM will bring a series of customized solutions that are inspired by real consumers to Vitafoods Europe 2019. At booth F10, product developers and marketeers will find winning ideas in DSM’s latest consumer insights and its science-backed innovations, with the show marking the launch of new product forms and a range of natural nutrient premixes. Consumer-driven innovation plays a defining role in shaping DSM’s solutions, and at the show DSM will be unveiling the results of its latest consumer health concerns survey. These insights, obtained from independent research conducted in ten countries across the EMEA region in early 2019, highlight the trends most important to consumers today and explore current attitudes and behaviors towards supplement usage. The findings are available to customers to support them in building their innovation pipeline and help their products succeed in the marketplace, with DSM now offering a diverse range of expert services. Launching at the booth are the latest innovations and additions to DSM’s product portfolio. These include the new life’sDHA™ S24-P100 powder. The first of its kind, DSM’s life’sDHA S24-P100 ingredient is highly potent and is made from a sustainable, natural algal oil source. Also debuting will be DSM’s highly stable, animal-free Quali®-A forms, recently launched to the dietary supplements market to meet the growing demand for vegetarian and vegan products. In line with its deep understanding of human health and consumer trends, DSM will also be introducing new customized nutrient premixes created with botanicals. These innovative, ready-to-market premix solutions have been developed for dietary supplement manufacturers looking to combine botanicals together with DSM’s essential micronutrients and unique nutraceuticals. DSM will also be highlighting its capabilities and solutions for personalized nutrition, and showcasing its partnerships with innovative start-ups in this fast-moving space. Visitors will have the opportunity to assess their own vitals and health status live at the show using the new diagnostic machines at the booth. A selection of DSM’s ingredients and solutions will be available to try at the on-stand prototype bar, where delegates can sample new product formats and exchange ideas with the DSM team. This includes new concepts (for men’s health, for instance) featuring the innovative, tomato-based Fruitflow® ingredient, which is part of DSM’s proprietary nutraceutical ingredient range. 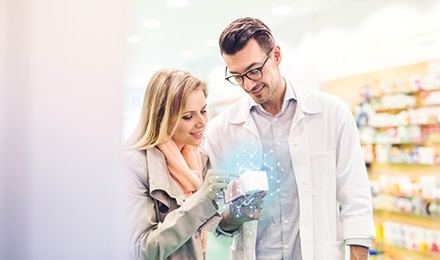 To discover brand-new consumer insights, taste our prototypes and talk to the experts, or to book an appointment with DSM at the show, marketing.DNPE@dsm.com?subject=Vitafoods%202019 or visit our website.